The Spanish influence on California and other areas of the Southwest, is still very evident in the culture including the food. 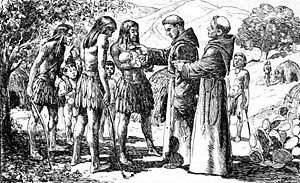 The Spanish missionaries who founded the chain of missions in California brought with them their culture and traditions and also adapted them to the products of the new world. In the United States we recognize the July 1 optional memorial of Bl. Junipero Serra, the Spanish Franciscan, who is the Father of the California missions. In Bess Anderson's California Mission Recipes cookbook, she acquaints readers with the various foods that would have been traditionally prepared and eaten in the missions. The ingredients used were mainly those harvested at the mission or occasionally those brought by ship. The preparations of the food in the missions most often was under the direction of a padre, with the preparation carried out by Indian women of the mission. Anderson indicates that from various records we know the missions had both lean and rich years. There were times, for example, when the daily ration of Father Serra consisted solely of 3 tortilla cakes and wine. Anderson's book as well as the various mission preservation organizations are sources of traditional mission-style recipes. Enjoy a recipe from the California mission tradition on the feast of Bl. 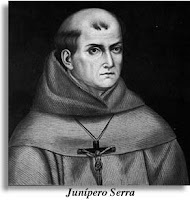 Junipero Serra. Sauté onion and garlic in oil. Add spices, stirring to blend. Add pork, drained and rinsed hominy, pork broth, green chiles and jalapenos. Cook at a simmer, covered, for 45 to 60 minutes or until the meat and hominy are tender. Add more water or broth as needed to keep pork covered in the final minutes of stewing. 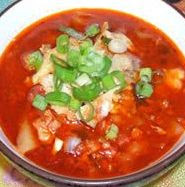 Remove posole from heat and cool slightly. Degrease the stew. Check to see if salt is needed. Reheat before serving. 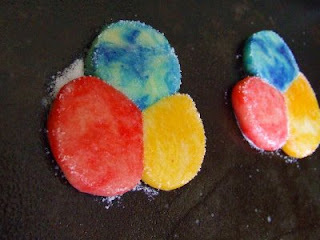 Beat eggs until light in color and thickened, add milk and melted shortening. Combine the flour, sugar and salt. Sift into egg mixture slowly and blend well, making a soft dough that doesn't stick to hands. Shape into walnut-sized balls and roll on a lightly-floured board into a round-shaped cakes similar to a tortilla. Fry in deep hot fat until golden brown in color - about 3 minutes on each side. Drain well. Sprinkle with cinnamon sugar. Make s 30 bunelos. Brown the pork on all sides in the butter. When brown add the vegetables, wine, and season with salt and pepper. Simmer for 2-3 hours or until the meat is tender. Serve on a heated plate. Strain the liquid in the pan over the meat. In a large pot, whisk masa harina into the warm water until thoroughly combined. Add milk, chocolate, piloncillo and anise. Bring to a simmer and whisk with a molinillo (a special tool to whip the drink) until chocolate is melted and sugar is dissolved. Add coffee and cinnamon to the scalded milk. Cover, let stand 5 minutes and strain. Heat chocolate over water, add boiling water, and sugar and cook until smooth and thick. Add the coffee-cinnamon liquid. When ready to serve, blend in the cold milk and vanilla. Serve in tall glasses with crushed ice. Serves 6-8. Measure 1C. dry cake mix; set aside. Combine remaining mix with 1 egg and oil. Press into bottom of greased pan(s). Bake @ 350 for 10 minutes. Meanwhile, combine reserved mix, 2 eggs and remaining ingredients. Beat at low speed for 2 minutes. Spread over crust. Bake at 350 about 35 mintues longer. Cool and chill. Top with whipped cream. June 21st is the feast of St. Aloysius Gonzaga. Catholic Culture suggests "instead of cooking a special treat for this day, perhaps try a light dinner or lunch, maybe a simple soup and bread to imitate this fasting saint. We have highlighted a vegetable soup, or minestrone from Italy, but pick your favorite to serve." Minestrone soup is also a great dish to serve for the feast on St. Joseph! Combine everything but pasta. Simmer on stove for 1 hour. Add Pasta and continue simmering till cooked. Top with grated cheese and croûtons. The last time I made it (shown in pictures) I served it with rolls since I was out of croûtons. However, for the feast of St. Joseph, you could top the Minestrone with crushed croûtons. The croûtons (breadcrumbs) symbolize the sawdust that would have covered St. Joseph's floor. The month of June is dedicated to the Sacred Heart of Jesus. In addition, the Solemnity of the Most Sacred Heart of Jesus is celebrated on the Friday following the Second Sunday after Pentecost, which will be June 19th this year. 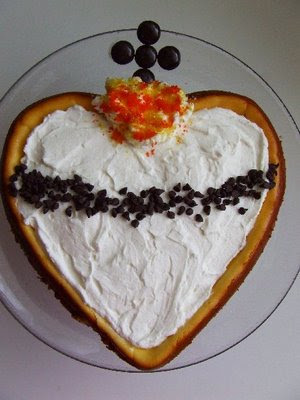 A fun way to celebrate at home would be to bake a heart shaped cake or cookies in honor of the Sacred Heart of Jesus. 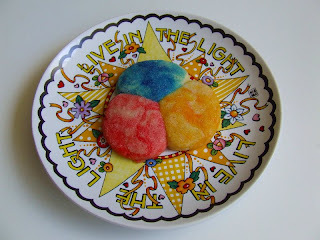 These cookies were served at this week's Summer with the Saints and quickly disappeared. The kids loved them! Frost cookies with white frosting. Add heart to center of cookie with the red frosting. Arrange chocolate sprinkles around center of the heart to represent the thorns. Add yellow frosting "flames" coming from the top of the red heart. Enjoy! As Charlotte pointed out last year when she posted a delicious Cappuccino Mousse Recipe for the feast of St. Pio of Pietrelcina, "according to the Oxford English Dictionary and the American Heritage Dictionary, the drink was named cappuccino because its color resembles the brown color of the robes worn by the Capuchin order of Franciscan friars. Others say it is because of the cappuccio or hood of the friar's robes." Since June 16th marks the anniversary of St. Pio's canonization, as well as the memorial of the Capuchin Martyrs of the Concentration Camps (who were beatified in June of 1999 when the Pope visited Poland), I thought I would post one of my favorite cappuccino recipes in their honor. My husband and I love Tiramisu. However, it is so time consuming to make that I rarely make it. So when I found this recipe, in one of my Pampered Chef cookbooks, which is very similar to Tiramisu, and OH SO MUCH easier, it was an instant hit! Enjoy! 1. Cut pound cake into 1-inch cubes; set aside. 2. In a bowl, whisk milk and instant coffee granules. Let stand 5 minutes or until dissolved. 3. Pour 1 cup of the milk mixture a measuring cup; set aside. Add pudding mix to remaining milk mixture in bowl; whisk until mixture begins to thicken. Gently fold in one container of whipped topping. 4. To assemble trifle, place 1/3 of the cake cubes into bottom of a bowl. Pour 1/3 of the reserved milk mixture evenly over cake cubes. Top with 1/3 of the pudding mixture, pressing lightly. Grate 1/4 of the chocolate over pudding mixture. Repeat layers 2 more times, reserving the remaining grated chocolate for garnish. 5. Fill a decorator with 1 cup of the remaining whipped topping; set aside. Spread remaining whipped topping over entire top of trifle, creating a smooth surface. Decorate by piping rosettes around edge of bowl. Grate remaining chocolate in center; sprinkle with cinnamon. "Exclusive for this weekend only, everyone can see the TOP 5 results for each category. See the results before they're gone on Monday morning." Catholic Cuisine has been nominated, and is currently listed in the Top 5, for Best Group Blog. Thank you to those of you who nominated us for this award! If you haven't had the opportunity yet, please consider clicking over and voting for us! 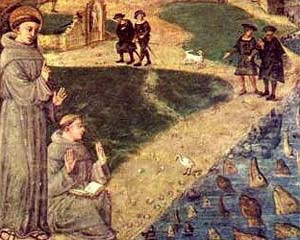 It is said that St. Anthony was a amazing preacher and as mentioned in the earlier St. Anthony post one legend indicates that even the fish rose from the water to hear his sermon. This weekend we will celebrate his feast day, June 13. He is called St. Anthony of Padua, as he is known for his service in Italy, but he was born in Portugal and a proud Portuguese people celebrate his feast ever year in great style. The feast there is known as Festos dos Santos Populares in Lisbon. Having been a people who depended heavily on the sea for food and commerce, the Portuguese have a fondness for fish in their popular festivities. 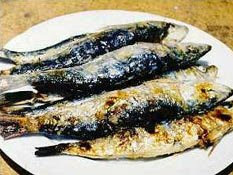 A major staple of the festos (feast day) is grilled sardines. All over Lisbon people grill and consume them. It is said that sardines represented those miraculous fish and were an important part of the festivities. The opening of sardine season coincides with the Feast of St. Anthony. Until traveling to Spain with my mother, my experience with sardines was limited to the canned variety. Fresh sardines are nothing like the canned ones - I found them to be quite a treat. But it can be a challenge to find fresh sardines, especially if you are land locked like I am. You may have to settle for frozen ones but still preferable to canned. Rinse sardines under cold water, drain, and blot dry. Sprinkle some salt in the bottom of a baking dish. Arrange half the sardines on top and sprinkle with salt. Add another layer of sardines and sprinkle with salt. Cover and let cure in the salt, in the refrigerator, for about an hour. The mystery of the Holy Trinity is not one that we will ever "solve." But just because it's not a solvable mystery doesn't mean we shouldn't continually explore it. Like the other moms who contribute here, I frequently explore our Church's liturgical year with food -- I think food provides a most teachable and memorable moment, especially for children -- even when it's a simple chocolate cake. To illustrate the three equal, but different natures of the Father, Son, and Holy Spirit, for the Solemnity of the Holy Trinity today, I decorated the top of a simple box-mix chocolate cake. While there is no one official symbol for the Holy Trinity, there are many possible symbolic designs to use. I used three circles together -- the Borromean rings -- to illustrate the Holy Trinity on our dessert cake. In each circle, I placed a letter, P for Pater, F for Fillius, an S for Spiritus. 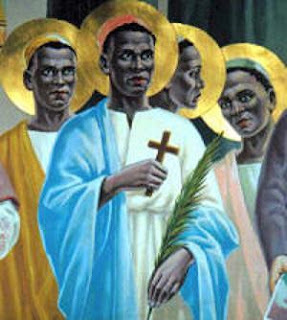 Today is the feast day of Charles Lwanga and Companions, 19th century martyrs from Uganda, Africa. They are the first martyrs of Sub-Saharan Africa. Saints such as Charles Lwanga are examples of the true universality of the Church and it's zealous followers. It is fun and educational to incorporate cultural foods of the saints into our feast day remembrances, especially ones that might not be familiar to us. There are a variety or recipes I found online that are representative of the Ugandan culture. Here is one that seems fairly simple and would make a nice tea-time snack. In a bowl, mix flour and sugar. 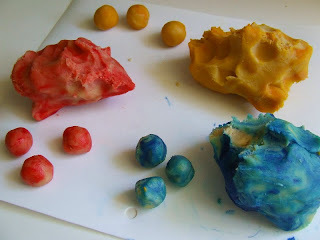 Add the egg and milk and stir to form a viscous dough. Heat the oil in pan. Add the dough one spoon at a time and fry until golden. Place on paper towels to remove excess oil and serve hot. Enjoy your amandazi with a cup of sweetened chai tea - a common beverage in the East African countries. We've talked before about Ember Days with some interesting recipes and history. Summer or Whit Embertide is upon us. This year, the Summer Embertide is observed on June 3, 5, and 6. The Summer Embertide is observed in June or July depending on when Pentecost falls that year. Seasonal significance: It is a time of thanksgiving for the grain harvest since this was typically the end of the wheat harvest in Mediterranean countries. Liturgical significance: Summer or Whit Embertide falls within the Octave of Pentecost. It is fitting then that this Embertide, though still a mini-Lenten time of fasting, is characterized by its spirit of thanksgiving and joy at the descent of the Holy Spirit. Ember Wednesday is a day of partial abstinence (only one meal of meat should be offered on this day). The day is dedicated to Mary, Our Blessed Mother and is a day of interior recollection. Ember Friday is a day of complete abstinence (no meat is offered today). The day is dedicated to penance. Ember Saturday is another day of partial abstinence. The day is one of great thanksgiving - thanksgiving for the seasonal harvest of wheat, thanksgiving for the spiritual harvest after the abundant graces given throughout the Easter season, and thanksgiving for the harvest of vocations and those men preparing for ordination in the service of Holy Mother Church. Menu ideas for the Summer Ember Days could reflect the seasonal offerings for your area for the summer months. I was inspired by Mary's Confirmation Party Foods post, so I'm adding my offerings for the Summer Ember Days to include some seasonal produce that continue to focus on Pentecost as we find the Summer Ember Days nestled in the Octave of Pentecost. Layer granola, vanilla yogurt and sliced strawberries in a dish. The red slices of strawberries can be arranged in the parfait to resemble the tongues of fire/descent of the Holy Spirit. This cool and light dish makes a wonderful breakfast or afternoon snack. I thought it would be symbolic to arrange thirteen strawberry tongues of fire - one for each of the apostles, as well as one for Our Lady, also present at Pentecost. Choose a favorite pasta. We prefer Rotini because the spiral shape is great for holding the dressing. You could also choose a whole wheat pasta to reflect the thanksgiving of this Ember season for the harvest of wheat. Cook your pasta to desired done-ness. Rinse the pasta with cold water to cool it and then allow it to drain for a couple of minutes - a drier pasta will hold the dressing better. Make a simple dressing using a packet of dry Italian dressing seasoning mix, 1/4 cup of a good red wine vinegar, and 3/4 of a cup of extra virgin olive oil. Pour these over the top of the pasta salad, mix thoroughly, refrigerate for a couple of hours and enjoy. By no means are you limited by the suggestions above! Brainstorm some favorite seasonal produce and add them in. This dish is a wonderful summer meal, and the addition of black beans gives it a heartiness with a bit of protein! :: Mayonnaise or plain yogurt to spread on the slices of bread. God bless you during the Summer Embertide!